Instructions: Click here to view a larger photo of this project. Stamp the leaves using Cheery Pansy Cling Stamp Set on the white paper with Ranger Archival Ink Pad - Leaf Green , cut out with the coordinating die, shade use this same ink and shape. 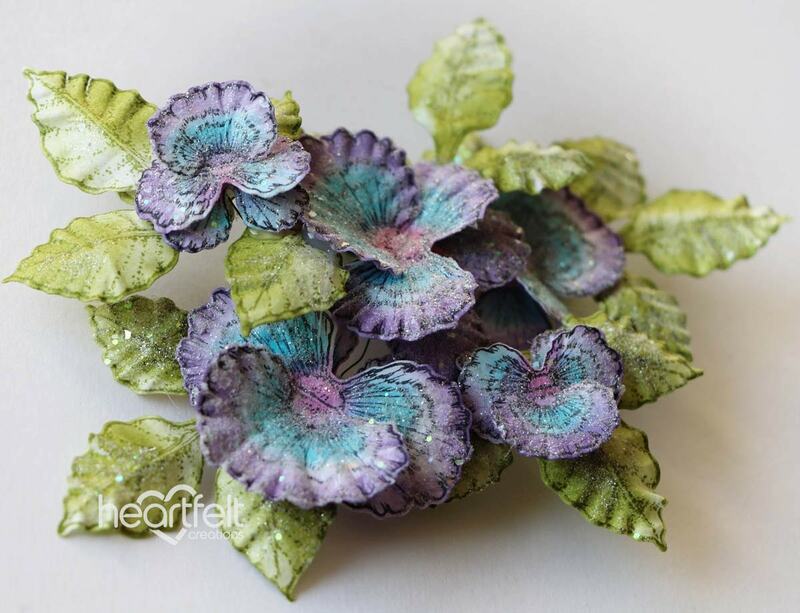 Shape leaves using Pansy Shaping Mold . To create flowers, stamp Cheery Pansy Cling Stamp Set on white paper with Ranger Archival Ink Pad - Jet Black and cut using the coordinating dies. Color with inks: Leaf Green, Deep Purple, Paradise Teal using sponge. Place the flowers in the Pansy Shaping Mold and sprinkle water on. Go through machine. Wait to dry. Layer the petals together using the hot glue gun. Using paint brush paint ready flower with Designer Dries Clear Adhesive and sprinkle Rajni Chawla's Crystal Clear Glitter. Using hot glue gun adhere some flower wire to flowers and put together to build bouquet, attach a pin to the underside using a hot glue gun.